Filling out forms on the web isn't the most exciting activity in the world, especially when you enter something the website doesn't expect. Most websites do a pretty poor job giving you feedback. For example, you submit your data, it reloads the page, deletes half the things you entered, and tells you "Please enter a password with 2 lower case letters, 4 uppercase letters, a number, and an even number of %^&# characters". 🤦 Lol & thanks, every travel or banking website I have ever used. 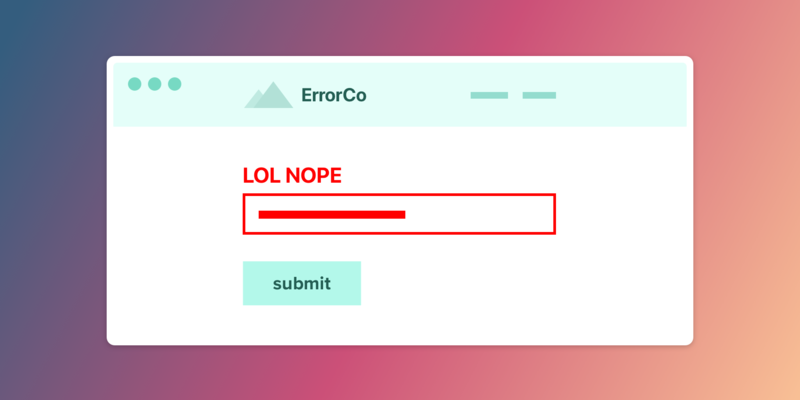 Many websites still roll their own form validation system, and making a something good from scratch is not a simple affair. Obviously, your users deserve a good experience when they get something wrong. And you deserve minimal pain in building out this experience. Fortunately today's browsers have form validation features built in. These features are pretty good now and are actually supported by 🎉 all current browsers 🎉. As with many browser features, there are warts. But you can work around them with a small amount of code and have something that feels good. I'm hoping this post exposes a couple more people to HTML5 form validation, or shows folks the current capabilities if they haven't looked at these features in a while. And you can choose your own adventure. The only thing required to start validating is using a couple HTML attributes, which is crazy easy. So let's start there. Submit this empty or with an invalid email. How do I style the <input> when it is valid or invalid? Can I specify custom error messages? If so, how? How do I style the error message? So let's dig into each one of these with an example. We will build step-by-step on the simple example above until we have something more custom and attractive. Notice, though, that it isn't very good. What is even happening? Ok, so the :invalid pseudo selector is kind of useless. Ideally we would not show an error up front or the whole time they are typing, just when they submit something unacceptable. Dave Rupert has a good solution that uses an input's invalid event. Instead of using the :invalid pseudo selector, he adds a CSS class to the input when it becomes invalid. We will extend this approach by removing the CSS class when the element becomes valid again. // Add a css class on submit when the input is invalid. // Remove the class when the input becomes valid. The browser provides default error messages. But they are super generic—"Please fill out this field", etc.—and may not be what you want. Generic as they may be, there is an upside to sticking with the default error messages: default errors are translated into the user's local language. e.g. If a user is reading your site in German, the default error messages will be in German also. The key to custom messages is using an input HTMLElement's setCustomValidity function, e.g. input.setCustomValidity('My custom message'). You can call this function at any time. If you pass a non-empty string, it will treat the input as invalid and not allow form submission. It is a flexible function. For example, it can be used to build your own validation for custom types. But setCustomValidity is a bit cumbersome for custom messages as you can't just override a specific message. It's "show this error no matter what" or nothing. <input> HTMLElements also have a validity object that tells you what, if anything, on the element is invalid. We can use input.validity in conjunction with input.setCustomValidity() to override specific messages. // check validity, and set a custom message if invalid. This email field accepts a and b chars before the @ symbol. You could extend this technique even further by passing in a special customMessages object for each <input>, or having it read custom attributes on the <input> containing the messages. FWIW, valid-form (a JS lib based on this post) does support custom attributes. Unfortunately the browser doesn't give you any control over styling the default error message display, and they are (of course) different on every browser. But you can render your own element when there is an error. Basically, you just hook the same events as the other examples, and insert a div wherever you like with the error. This example is the same as above, but it will show the error message next to the label instead of as a tooltip thing under the input. // We can only update the error or hide it on input. // Otherwise it will show when typing. // We can also create the error in invalid. The examples in this post didn't show absolutely all the validation possibilities. Here are a couple quick tables that hopefully help in your validation quest. Using these attributes will show validation errors, or limit what the user can enter into an <input>. <input min="2"> Number value must be >= the value. Only works on type="number" or type="range" inputs! <input max="10"> Number value must be <= the value. Only works on type="number" or type="range" inputs! <input step="2"> Number value must be a multiple of this number. Only works on type="number" or type="range" inputs! <form novalidate> Disable HTML5 form validation for the form. email Input must be a valid email address. url Input must be a URL that starts with http. number Input must be a number. There are many more acceptable values for the type field. Using the correct type may save you from having to validate an input at all, yay. You can style <input>s in various states with a couple pseudo selectors. Remember the object with custom messages above? valueMissing etc. are based on an <input>'s input.validity object. e.g. input.validity.valueMissing is true when an <input> requires data from the user. valid Boolean indicating the element meets all constraint validations, and is therefore considered to be valid. When true, all of the following properties in this table will be false. When input.validity.valid === false, one or more of the properties will be true. badInput Boolean indicating the user has provided input that the browser is unable to convert. patternMismatch Boolean indicating the value does not match the regex pattern specified in the pattern attribute. rangeOverflow Boolean indicating the value is greater than the maximum specified by the max attribute. rangeUnderflow Boolean indicating the value is less than the minimum specified by the min attribute. stepMismatch Boolean indicating the value does not fit the rules determined by the step attribute (that is, it's not evenly divisible by the step value). tooLong Boolean indicating the value exceeds the specified maxlength attribute for HTMLInputElement or HTMLTextAreaElement objects. Note: This will never be true in Gecko, because elements' values are prevented from being longer than max attribute. tooShort Boolean indicating the value fails to meet the specified minlength attribute for HTMLInputElement or HTMLTextAreaElement objects. typeMismatch Boolean indicating the value is not in the required syntax (when type is email or url). valueMissing Boolean indicating the element has a required attribute, but no value.